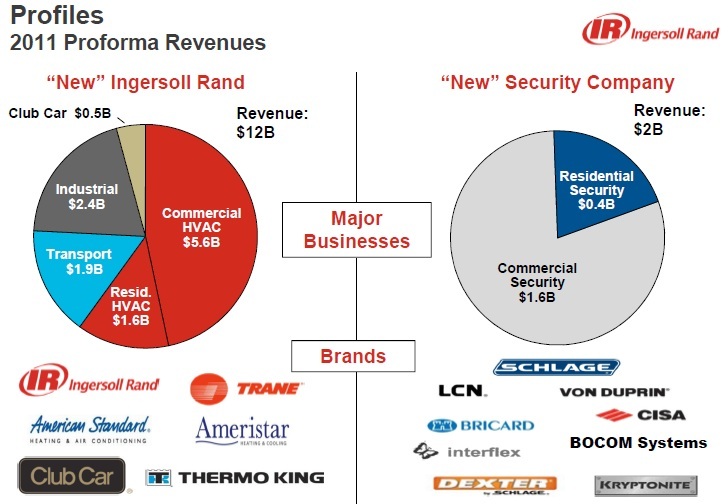 Multinational conglomerate Ingersoll Rand stunningly announced plans to spin off its multi billion dollar security business, including its flagship security brand Schlage. In this note, we examine the details of the plan, the motivation behind it, compare to Schneider, UTC and Honeywell plus discuss what happens next. The security division takes in $1.6-$2.0B in annual revenues. The company has stated it expects the sell-off to be completed in about a year. While movement within individual lines is not uncommon - for example, Schlage recently spun off its Access Control business to Vanderbilt Industries - the wholesale spin out of an entire billion dollar business is uncommon in the security market. IR plans to load up the spun off security division with significant debt, targeting a debt/EBITDA ratio of ~2.75x to 3.25x. While not likely risky for the business, it is an indicator that maximizing cash flow and earnings per share is driving the deal, not innovation nor expansion in the security market. "Analysts say the benefits from dismantling Ingersoll are limited, noting the company's stock price adequately reflects the value of the company's parts. They estimate the price of new security company's stock at about $10 a share, with the remaining parts of Ingersoll worth about $40 a share. "Ingersoll-Rand is not screaming at us as a candidate [for breakup]," said Deane Dray, a multi-industry analyst for Citi Investment Research. "On a sum-of-the-parts basis, there's no parts that need to be unlocked." "We like the idea of a big share [repurchase], but spinning off security ...makes little sense," added Jeff Sprague, an analyst for Vertical Research Partners, which dropped its rating on Ingersoll to sell from hold on Monday with a $46 target price." While the stock market's mood on the plans appear to be confused, the deal is expected to raise efficiency in IR's other business units. These divisions primarily manufacture machinery and construction equipment. Overall, the conglomerate has not performed as strongly as its rivals in recent quarters, which some attribute to the broadness of its brands. The potential upside for IR security is that it can now focus on its own goals and plans within security, rather than being part of a broader, more disconnected conglomerate. This might help them make better decisions and be more aggressive about security specific product development and marketing. While the company indicates that security will be spun out as a whole, we believe its possible that the European focused units might eventually be spun out of the new security company as they are a small portion and not very closely related to the overwhelmingly North American focus of organization. This runs against historic trends of massive conglomerates with businesses spanning various industrial areas including security. For instance, Honeywell, UTC, and Schneider all have similar breadth. More importantly, it raises the questions of the 'synergies' and value of brining such diverse divisions together. From a product perspective these conglomerates have generally lagged against their more focused and smaller competitors. Perhaps this is a sign of what will come for other conglomerates, or at least what should come. Regardless, for those who perpetually bloat about consolidation, this is a move in the opposite direction.